Today you are given a glimpse of the workings of the whole, and how its parts move inevitably according to its needs: the gods speak and the world turns. Mount your longboard and take aim for your place on the shore. Casting Notes. 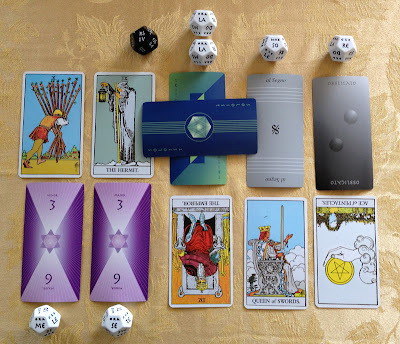 The keycenter of Bb Descending indicates energy moving downward from the Crown into the Third Eye Chakra, from the transpersonal into personal insight. The scalepoint of fa descending indicates transition from the ineffable to the palpable. The Octave of Brass indicates strength in the realm of movement and creativity: bold moves. Musical notes. In the key of Bb, and Eb-in-octaves blast of brass. Now is a time for deep listening to someone else’s ideas. Let go of the need to agree or disagree for a moment – just listen, allow yourself to feel what they say, allow them their view, see where they’re coming from. See where that approach leads. Casting notes. The keycenter of Gb Descending indicates energy moving downward from the Throat toward the Heart Chakra: what is said is felt. The scalepoint of me ascending indicates a time of acceptance and forgiveness. The Soloist of Woodwinds indicates an independent thinker. Musical notes. In the key of Gb major appears an airy, flutey A, utterly and beautifully itself. Who is She for you? Mary? Quan Yin? Gaia? Sofia? Your own mother, alive or dead? An undefined yet palpable presence within? In Nature, in the workings of the universe, in our own lives and hearts, She abides: infinite compassion, infinite mercy, and infinite, egoless strength. You remember Her: that is the gift of today. And today you have the honor of remembering Her to others: through your kind words. Let go, let Goddess. And speak. Casting notes. 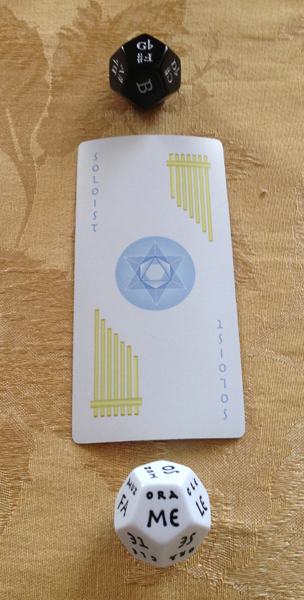 The keycenter of Ab descending indicates energy moving downward from the Third Eye to the Throat Chakra: insight moving into communication. The scalepoint of “me” ascending speaks of a time of acceptance and forgiveness. The Perfect Fourth of Voices speaks of conscious yielding, of the Divine Feminine, in the realm of Spirit, with an emphasis on communication. Musical notes. In the context of Ab Major the note B appears with an E above it, and an E major triad is implied. Ko je Ona Vama? Devica Marija? Kuan Jin? Gaja? Sofija? Vaša rođena majka, živa ili ne? Misteriozan osećaj, nešto neodređeno u Vama, ali opipljivo i prisutno. U prirodi, u funkcionisanju univerzuma, u našim životima i srcima.Ona ostaje: beskonačno saosećanje, beskonačna milost, beskonačna, nesebična snaga. Zauvek je pamtite: to je poklon dana. Upravo danas imate čast druge da podsetite na Nju: kroz Vaše ljubazne i nežne reči. Oprostite drugima u Njenu čast. Tumačenje otvaranja: solfeđo ključ Ab, silazno, prikazan na crnoj kocki, označava energiju kretanja od "trećeg oka" ka čakri Grla; od sasvim jasnog shvatanja ka komunikaciji, to jest izgovaranju istog. Notna skala ME govori o vremenu prihvatanja i opraštanja. "The Perfect Four of voices" ("savršena Četvorka glasova") ukazuje na (božansko i ženski pametno) svesno popuštanje u duhovnom carstvu, s naglaskom na komunikaciji. Muzička zabeleška: U ključu Ab "nota B", prikazana sa oznakom "E" iznad, implicira E dur trostrukog akorda. Duh doline nikada ne umire. Nazvana je koren neba i zemlje. Kao da večno odoleva i deluje bez upijanja. Casting 02/13/13 - Let 'er Rip! Initial impressions. A gift from the higher self, from transpersonal knowledge to personal insight. The movement from minor to major, from acceptance of burden to hopeful intent. The karmic necessity of developing emotional autonomy. The vigor that can be derived from following the intuition, from confirming its validity. The offsetting of burdens by the innate capacity for success. The Keycenter. Bb Descending indicates movement downward from the crown chakra into the third eye, from the transpersonal to the personal, from shared wisdom to personal insight. In this particular roll, the die was pointed off to the left more than down, which puts an emphasis on events of the past. … until now, at position 2. Se in the key of Bb is do in the key of E: it is the Point of Intention. And here from this point arises a Major Third of Voices: musically, it really sounds like we’re in E now. This intention blossoming within is imbued with the ease and resolution of the Major Third, and is interdependent with the spiritual autonomy expressed in the Hermit card above it. (Autonomy, in fact, is a strong theme in this casting: the Hermit card precedes the Soloist of Strings found in the next position, both in position and pitch.) The Hermit is alone, the seeker, the climber of the sacred mountain; the six-pointed star in his lantern, the Seal of Solomon, shines with the wisdom flowing downward from this casting’s keycenter; his staff is a purer form of the scepter of the Emperor found in position 3. A Major Third of Voices and the Hermit at the Point of Intention: the sacred desire for being attainment, and the remembering and pursuit of that desire as balm to the soul. Position 3. Here we come to the axis of the casting, the crucial point around which all else revolves. The scalepoint is la descending, the Point of Governance: the rules of the game must be heeded. And the rule is: transform your feelings of dependence into feelings of autonomy. The need for approval, for validation, must be set aside: it is the Soloist’s time to shine. She/he is empowered by the Tritone, goosing him/her forward into a future beyond any we can imagine (a tritone built downward from G leads us to the key of Ab.) Help is available within: the Emperor tells we can do this, we can take charge. And we can (must?) do it without being tyrannical: we know that the Emperor’s scepter is the Hermit’s staff in disguise (I’m reminded of Gandalf when he comes to rescue Theoden from possession by Saruman: “You wouldn’t part an old man from his walking stick…”) A Tritone of Strings crossed by a Soloist of Strings under la with the Emperor ascending: the need for emotional independence and the juice and the chops to get it. Position 4. This transformation of feeling that needs to take place, this upcoming manifestation of the new true you, needs a fuel supply. Lucky for you you’ve got one at so, the Point of Vitality. Thanks to the descending gifts flowing downward from your crown into your third eye, your intuition is keen, decisive, and not easily fooled, as personified by the Queen of Swords. When your energy starts to flag, look to the signs: al segno. Because you can. Summary. The first position is about burdens and heaviness of spirit; the last position is about burdens and the ease of overcoming them. Getting from the first to the last involves all that’s in between: remembering your true path, and the utter need for autonomy, especially in the realm of feeling. It may seem a tough road, but you’ve got powerful friends: you are the Emperor, don’t forget, and the Queen of Swords besides, and you’ve been granted a channel between your crown chakra and third eye. Not bad for a Wednesday afternoon. Antsy? Restless? Feeling “gotta move” so strong you’re almost panicked? Remember: that feeling, that sense of urgency, has its own life, its own needs and consequences; and while it may seem to be an essential driving force, it may actually be pulling energy or distracting you from your goal. Relax your body, accept where you are, calmly focus on your heart’s desire: allow the act of centering to convert the coarse fuel of anxiety to the finer fuel of wish. Movement will come: nothing stays in the same place for long. Nemirni ste? Toliko snažno osećate kao da morate da se pokrenete da ste skoro u panici? Zapamtite: taj osećaj hitnosti ima svoj sopstveni “život”, svoje sopstvene potrebe i posledice i iako često izgleda kao neophodna pokretačka snaga, u stvari može da Vam oduzima energiju i ometa Vas u Vašim ciljevima. Opustite svoje telo, prihvatite ono što jeste i gde jeste trenutno, smireno skoncentrisani na želje svog srca. Dozvolite prizemnosti da Vam pomogne da sirovo gorivo strepenje i nervoze pretvorite u pokretačko gorivo Vaših želja. Promene će doći, jer ništa ne ostaje na istom mestu dugo vremena. Tumačenje otvaranja: Silazni ključ C, prikazan na crnoj kocki, predstavlja prvu čakru i neophodnost prizemljenja. Solfeđo nota ME uzlazno indicira prihvatanje i opraštanje dok karta “Minor Sixth of Horns” označava želju i čežnju za pokretom i kreativnošću. Muzička zabeleška: U silaznom ključu C, prikazanom na kocki kao Eb sa oznakom C iznad, nalazimo snažnu čežnju koju sobom nosi ključ u molu, posebno naglašen kod limenih duvačkih instrumenata. Clarity and clutter are mutually exclusive. Be honest, even brutally so, and kiss your cherished distractions goodbye. Casting notes. The keycenter of A# Ascending indicates energy moving upward from the 5th to 6th chakras, from communication into insight and intuition. The scalepoint of “la” indicates acceptance; the Editing card speaks of culling, of letting go of the unnecessary. Musical notes. An F## arising in the key of A#, resounding a sweet yet pointed question throughout the day: Is this needed? Jasnoća i haos isključuju jedno drugo. Budite iskreni prema sebi, pa makar to i bolelo, i pozdravite se sa svime što Vam odvraća pažnju. Tumačenje otvaranja: Ključ A, prikazan na crnoj kocki, označava kretanje na gore, od pete ka šestoj čakri: od čakre komunikacije ka čakri Vaše intuicije. Solfeđo nota LA, prikazana na beloj kocki, označava prihvatanje, dok karta EDITING govori o potrebi odvajanja "žita od kukolja" i oslobađanja od svega nepotrebnog u Vašem životu. Muzička zabeleška: Nota F## koja proizilazi iz A# ponavlja nežno, ali uporno i direktno, pitanje dana: Da li mi je to (nešto) zaista potrebno? If you’re trying to make something happen and you find yourself going in circles, the problem may not lie only in the situation at hand. Look to the bigger picture, consider the broader context: somewhere there a pattern needs to be broken, something there needs to move on. Casting notes. The keycenter of D references the 2nd chakra: creativity. The scalepoint of “so” indicates a point of “broad challenge,” of a challenge bigger than what’s right in front of us, and with deeper implications. The “al coda” card is a directive to jump to the final passage, to cut to the chase. Musical notes. In the key of D, we finally hear an A – a perfect fifth, a call to action. Ukoliko pokušavate završiti nešto i osećate se kao u da se vrtite u krug, problem bi mogao biti nešto šire prirode. Sagledajte širu sliku situacije u kojoj se nalazite: neki obrasci bi trebalo da budu prevaziđeni, a Vi da jednostavno nastavite dalje. Tumačenje otvaranja: Ključ D, prikazan na crnoj kocki, predstavlja drugu čakru: kreativnost. Solfeđo nota SO, prikazana na beloj kocki, indicira širi izazov, veći od onoga koji je trenutno pred Vama, a koji sa sobom nosi dublje implikacije. "Al Coda" karta označava instrukciju, ili naredbu, da se prekine začarani krug događaja i da se pređe na završetak "pesme". Muzička zabeleška: U ključu D možemo čuti notu A - savršenu petu harmoniju, poziv na akciju. Idemo!